I find the White-eyes fascinating little birds that have such a neat visible eye. The Lord has created another bird kind that has been obeying the command that it was given. The white-eyes are small passerine birds native to tropical, subtropical and temperate Sub-Saharan Africa, southern and eastern Asia, and Australasia. White-eyes inhabit most tropical islands in the Indian Ocean, the western Pacific Ocean, and the Gulf of Guinea. Discounting some widespread members of the genus Zosterops, most species are endemic to single islands or archipelagos. 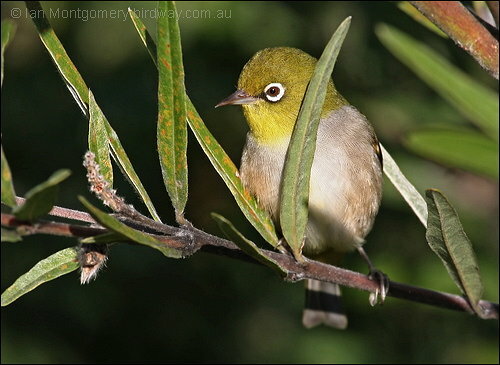 The Silvereye, Zosterops lateralis, naturally colonised New Zealand, where it is known as the “Wax-eye” or Tauhau (“stranger”), from 1855. The Silvereye has also been introduced to Hawaii as well as the Society Islands in French Polynesia. White-eyes are mostly of undistinguished appearance, the plumage being generally greenish olive above, and pale grey below. Some species have a white or bright yellow throat, breast or lower parts, and several have buff flanks. As their common name implies, many species have a conspicuous ring of tiny white feathers around their eyes. The scientific name of the group also reflects this latter feature, being derived from the Ancient Greek for “girdle-eye”. They have rounded wings and strong legs. Like many other nectivorous birds, they have slender, pointed bills, and brush-tipped tongues. The size ranges up to 15 cm (6 in.) in length. Matthew 6:26 says, “…yet your heavenly Father feeds them.” He has made a special tongue for them to accomplish this feat. All the species of white-eyes are sociable, forming large flocks which only separate on the approach of the breeding season. They build tree nests and lay 2-4 unspotted pale blue eggs. Though mainly insectivorous, they eat nectar and fruits of various kinds. The Silvereye can be a problem in Australian vineyards, through piercing the grape allowing infection or insect damage to follow. The White-eyes were in the Timaliidae (Babblers) Family but now are in the Zosteropidae (White-eyes) Family. (They are constantly shuffling the families around and it is hard to maintain the web pages.) At the present time the Yuhinas and Babblers are not in with them. One thing that has kept this busy is that the White-eyes have been diversifying with rapid speciation. 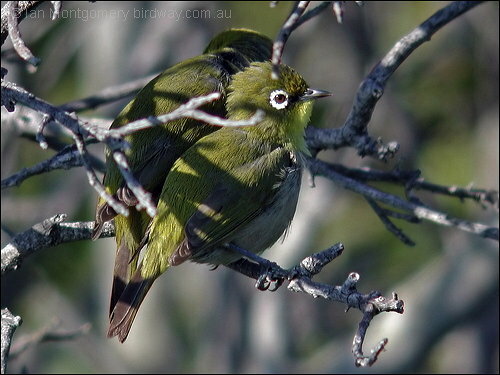 According to National Geographic’s Complete Birds of the World, the Silver-eye has migrated across 1,250 miles of open sea from between southeast Australia to Tasmania, New Zealand. That is quite a feat for birds that are only 3-6 inches long. Again, God has created much ability in these little birds. Below is a video by Keith Blomerley of a Cape White-eye. This entry was posted in Birds and tagged Birds, Birds of the World, Birdwatching, Creation, Videos, White-eye, Zosteropidae. Bookmark the permalink.